Bathing outdoors can be fun! A rather philosophical episode two finds Kou gradually accepting his new lifestyle, including relating to Nino as a woman, making new “friends”, being called “Recruit” (or “Ric” for short), and even more eyeball. If anything, I found this episode funnier than episode one. It also had some great artwork, and Nino managed to release a little more humanity from the personality armor in which Kuo finds himself encased. Kou ('Ric') in a reflective moment. This episode begins very poetically, featuring some of the nicest artwork in the series so far. Kou expresses his desire to move beyond the superficiality that has constituted his life. He now sees the need to penetrate deep beneath even the emotions that appear to give form (or deform) the public persona. 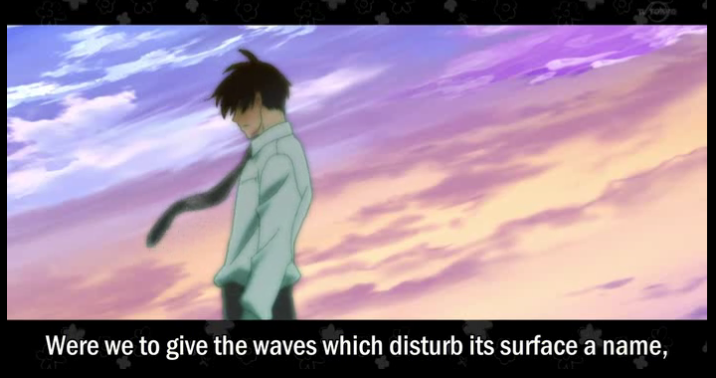 Kou’s search for his true self is likened to the exploration for creatures living in the unexplored depths of the ocean. As Kou begins to look at Nino as a woman, instead of just a debtor who must be repayed, he realizes that she is quite attractive. This is played comically both in the scene where he tries to make small talk, and in a scene in which he finds Nino bathing outdoors. 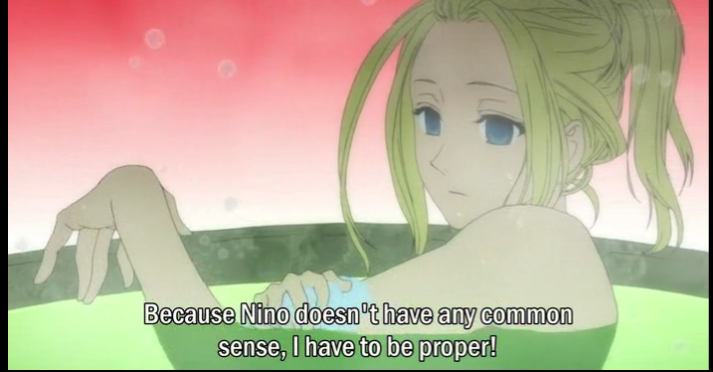 The bathing scene becomes unexpectedly emotional for Kou, when Nino gives him something he thought was lost forever, the warmth of physical contact, supplied freely, with no request for repayment. This episode also sketched in a few more characters, but we weren’t truly introduced to most of them. 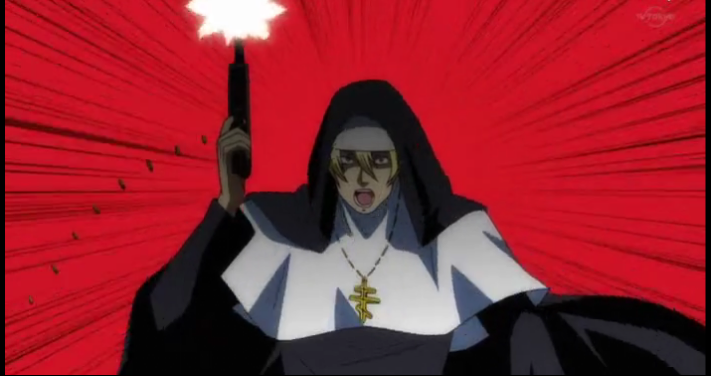 One character who was introduced (to hilarious effect) was Sister, a nun with an attitude. I had been looking forward to meeting this character ever since I saw the design on the show’s website, and I was not disappointed! 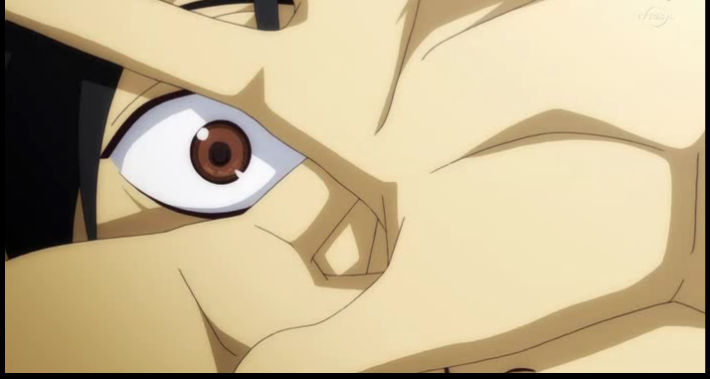 Sister is voiced by Takehito Koyasu (e.g. Ken, from Fist of the North Star, il Palazzo, from Excel Saga, etc., etc., etc.). 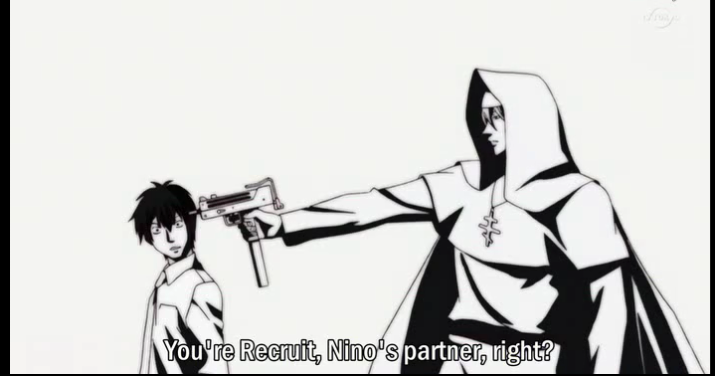 This character is over-the-top enough to make the Mayor, Kou (AKA Recruit), and Nino seem like they are sane. I love the way her robes flap out ominously, like Batman when he’s in a bad mood. I’m sure anyone who has had experience in a Catholic school knows, when Sister says, “everybody, line up,” you do it without delay or back talk. This episode also added the ED and a very nice OP, which I have already reviewed separately. I’m impressed. This show is definitely more along SHAFT’s style. The only way for me to put it into words is that it’s delightfully weird and funny. It is an excellent match for their style, isn’t it? On the one hand it can be fun to see artists challenging themselves, on the other hand, a match like this means the production company isn’t fighting against the source material. The end product can’t help but seem to work better.